We snapped up the decommissioned Sea King in an online MOD auction for £7,000 in March 2016. The giant helicopter was then transported 320 miles by road before being craned into position on our picturesque Thornhill campsite a month later. Over the summer months, we have lovingly restored her exterior to its former glory. We sourced some original rotor blades and replaced her tail rotors with some we discovered on Ebay, as we wanted her to still look like a helicopter from the outside. Her once peeling paintwork is a thing of the past after several days spent sanding her down and completely repainting her, whilst making sure we kept all her original signage. We thought we might have trouble finding the right shade of grey, but it turns out farm oxide paint – normally used for farm buildings or fencing – is a perfect match for her military colour. We’ve kept and restored all of her original lighting, so when you see her lit up a night she looks as if she is ready to take off. 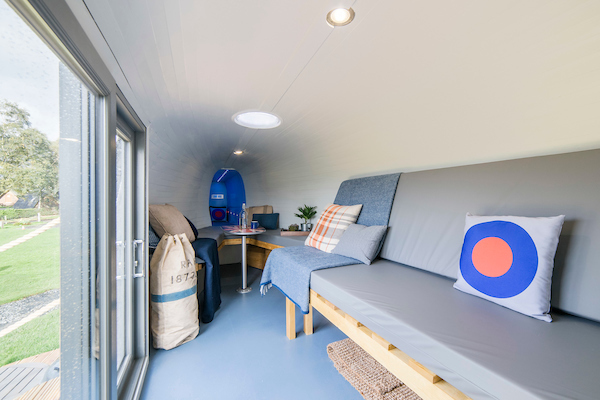 Meanwhile, we’ve transformed her spacious interior into a remarkable holiday home that sleeps a family of five (2 adults and 3 children) with a double and a triple bed as well as single bed in the tail. 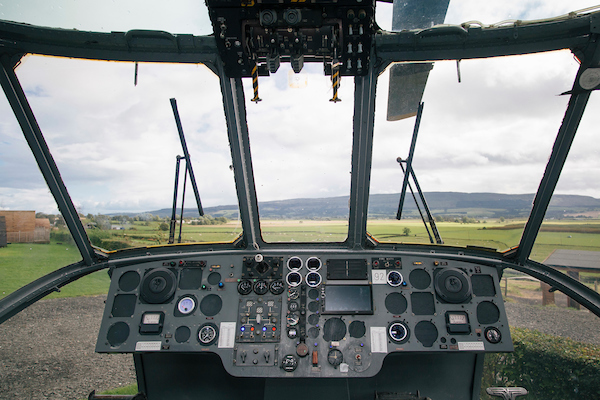 To make sure the helicopter is cool in summer and warm in winter, the curved walls have been insulated, wood panelled and painted which gives the inside the look of an upturned hull of a boat. To let in more light we’ve installed a sun dome and doubled glazed patio doors have been added to the side of the helicopter, which lead out onto a decked area where you can watch the sunset over the hills. The original sliding door has been retained to give you extra privacy when you retire at night.